Product prices and availability are accurate as of 2019-04-23 01:18:05 UTC and are subject to change. Any price and availability information displayed on http://www.amazon.com/ at the time of purchase will apply to the purchase of this product. 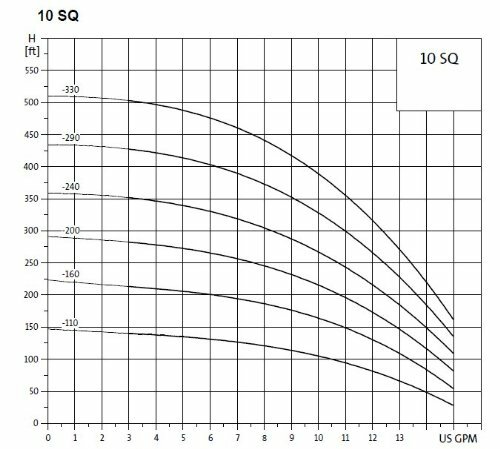 Grundfos 10SQ05-160 3" Submersible Water Well Pump 10GPM 1-/2HP 100-115V 1-1/4" Discharge Material #: 96160167 Overview The Grundfos SQ 3" submersible pumps offer a wide performance range, making it easy to find a model that will suit your individual requirements. The SQ is a compact, 3" multistage centrifugal pump that can be installed in a borehole no larger than the pump itself. With their built-in electronics, SQ pumps are very easy to install and operate. They guarantee a reliable water supply at all times. Equipped with permanent magnet motors, these flexible and compact pumps offer excellent efficiency levels and will supply pump heads up to 200 m. If the SQ pump is connected to the Grundfos CU 301 control box, it enables the creation of a constant pressure water supply. Applications SQ/SQE pumps are suitable for both continuous and intermittent operation for a variety of applications: •Ground water supply - private housing, small waterworks, small irrigation systems •Liquid transfer in tanks •Pressure boosting •Environmental applications - remedial pumping or sampling •Garages and petrol stations. Features and benefits •Dry-running protection •Permanent magnet motor with high efficiency •Wear resistance from floating impellers •Protection against upthrust •High flow velocity •Soft-starts reduce wear on motor •Over- and under-voltage protection •Overload protection •Over-temperature protection.